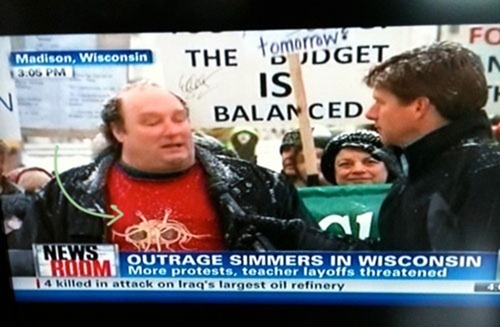 Michael spotted this man protesting the anti-union measures in Wisconsin today on CNN. 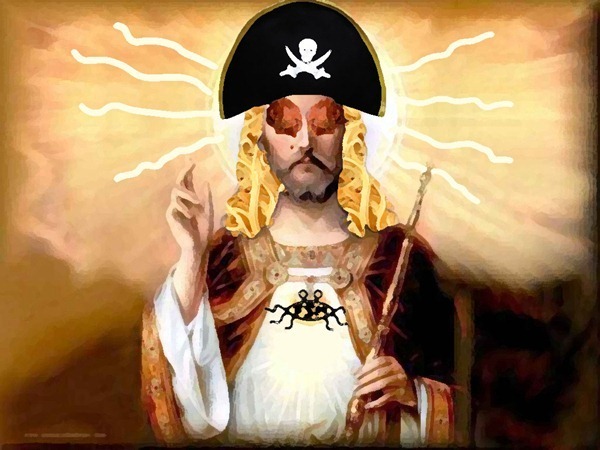 I know there are many Pastafarians in Madison and that most all of us are in support of your efforts. Stay strong, guys. Let us know how we can help. 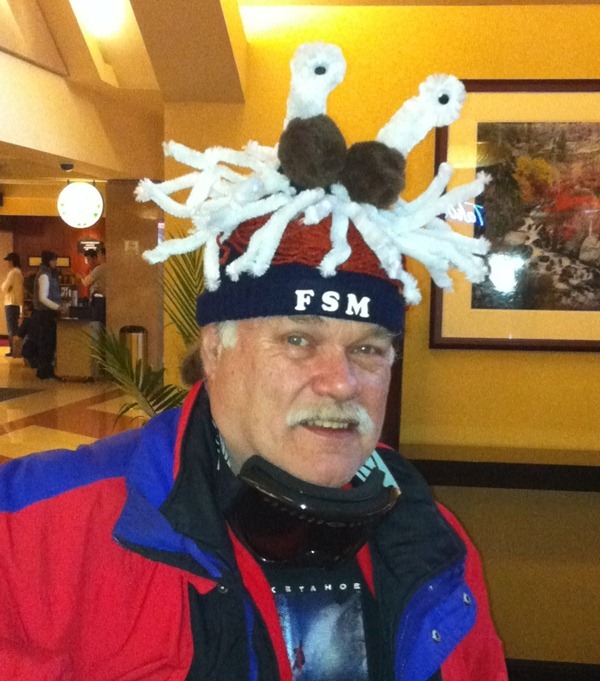 Steve sent us a picture of his new ski hat. I love it. *Update* Steve wrote instructions so you can make your own. Noodly appendages. Two 12-packs of "chenille stems". Mine were 12 inches long, 15mm diameter. Eyestalks. Chenille rope. This came as a long length, larger diameter than the stems. Cut to length. Eyes. Come in packets of various sizes, mine were 1/2in diameter. Meatballs. Brown colored pom-poms. Approx 3in diameter. (optional) Meat sauce. One ball of red-brown "marinara" colored yarn or wool. (optional) Iron-on fabric letters. Mine were 3/4in tall. Most of the above should be available at your local craft store, I picked up mine at Hobby Lobby. Eyestalks. Start by making the spiral at one end (the spiral provides a base to stick on the eyes). Then create the rest of the flat "U" shape and finish up with another spiral. Cut off any excess (see diagram). The wire in the material allows the eyestalks to stand upright and be pointed in any direction. Attach the eyeballs with rubber cement. I put two at each end of the stalks, one on each side – his noodliness is all-seeing! Lay a book or two on top to clamp it down while the glue sets. Attach meatballs and eyestalks. Lay the flat bottom part of the eyestalk assembly across the top of the hat. 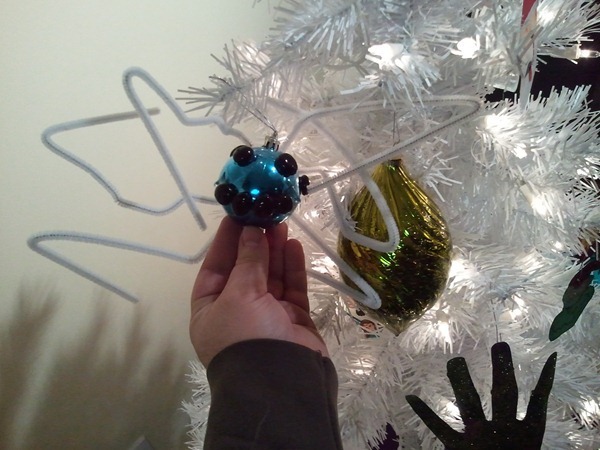 Take your needle and thread and attach the meatballs to the hat, while at the same time holding the eyestalks in place. Add noodles! Poke the noodles into the hat from the outside. When halfway in, loop the noodle back on the inside and poke it back out, half an inch or so to the side of where it went in. 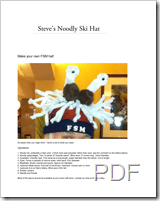 Poke the noodles in all around the hat, but close to the meatball/eyestalk combination, i.e near the top of the hat. 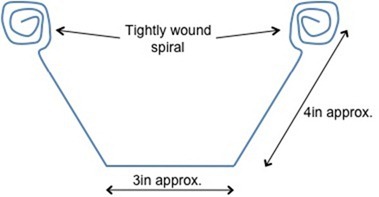 At the end of each noodle fold it back on itself for the last quarter inch or so to prevent any sharpness from the end of the wire injuring those being touched by his noodly appendage (see diagram). The wire in the chenille stems means they will keep their shape and they can be arranged to your satisfaction, or left to the rigors of normal wear. Add sustenance. 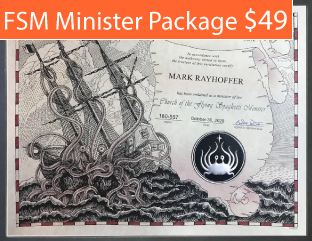 While being anointed by his noodly presence it is only right to provide him sustenance. Loosely wrap the yarn around the hat multiple times (I think we did 30-40 wraps), and secure it loosely in place at four points around the hat with needle and thread. Add letters. I turned up the bottom inch and a half of the hat brim and ironed on the letters. The instructions called for a hot iron but this will melt, or seriously flatten, polyester fibers in the hat itself. Experiment with lower temperatures that still allow the letters to adhere, if you have a polyester hat. Once again I added letters both front and back so that all could revel in his noodliness. Feel free to experiment with the ingredients and construction, depending on personal preference and availability. My thanks go to Sue for her help with all aspects of construction that involved needle and thread! 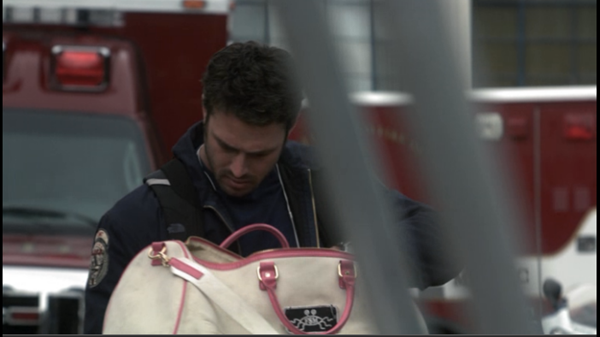 Edgar spotted the FSM in Episode 17 of Trauma. I stumbled across this old painting in an ancient text on the internet. It looks like a powerful Pastarfarian. Check out those lovely spaghetti locks and luscious meatball eyes. 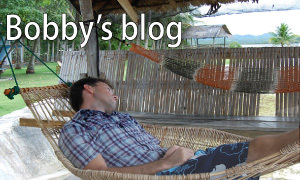 I wonder, is there more to the story than we yet realize? 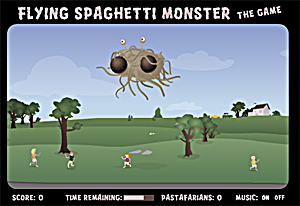 Could The mighty Spaghetti Monster have sent a messenger to this world in times gone by to preach of His noodly love? 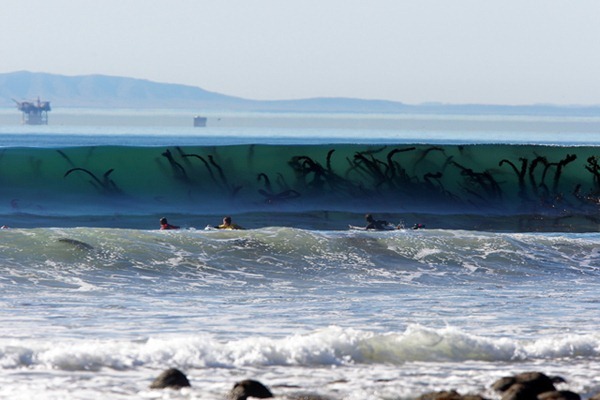 Charles sent in this sighting of the FSM’s Noodly Appendages in the surf in California. 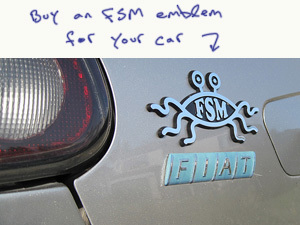 Thanks to AJ for showing these – clearly FSM inspired – “On Top of Spaghetti Cupcakes”. Here’s the site/recipe. And the video below. 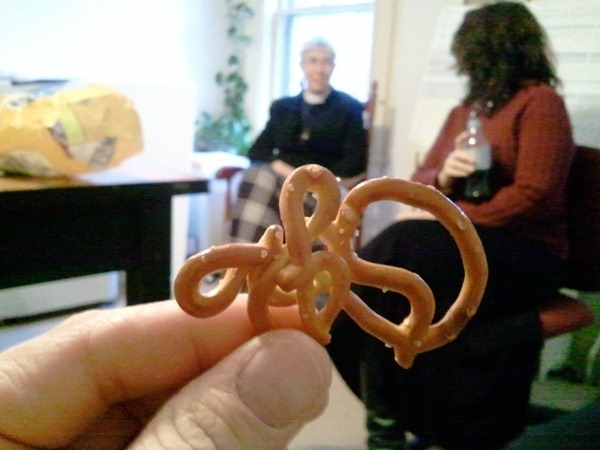 While eating a bag of pretzles at my mother in law’s installment as rector of an Episcopal church in New Hampshire l, I came across This visage of his Noodley Goodness! I knew for sure that he was watching over me as I was being tempted by another! I would love to know who is the owner of this beautiful display. Well done. Decorator, please let me know who you are so you can get some credit on your handiwork. At a make your own ornament xmas party. 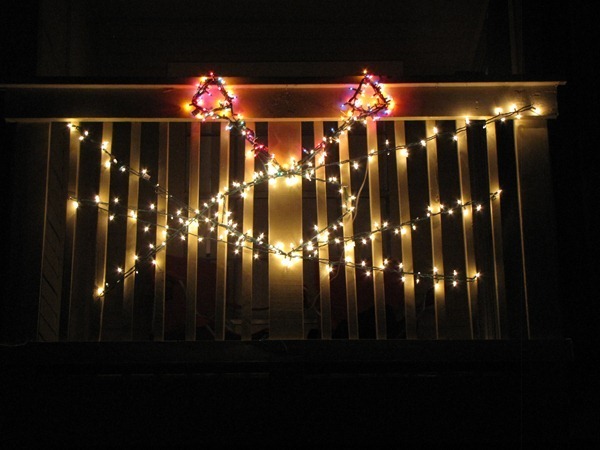 I hope my FSMas lights are a sufficient praise enough. 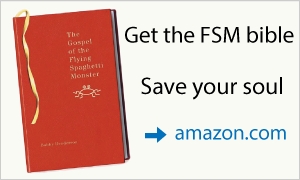 I think you did an great job and passers-by and the FSM Himself will be happy with your works. Well done, sir. 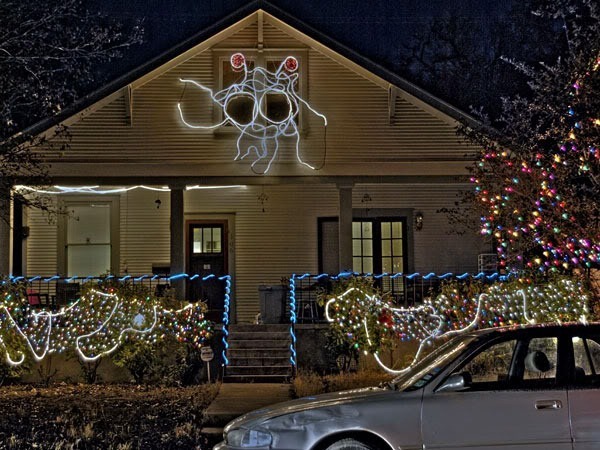 Any other FSMas light displays out there? Please send me your photos, we would all love to see them.